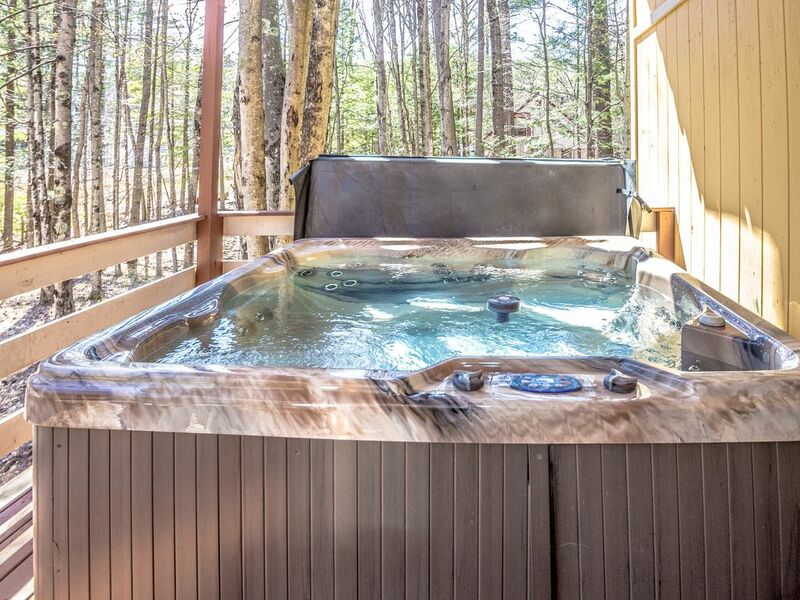 Hot tub, Game Room - Minutes from Cranmore, Saco, Village, Outlets, Storyland! Large Home - Perfect Location - Ask about Spring and Summer Specials! Open and inviting 6 bedroom/ 4 bathroom vacation home available year round. Outdoor year round hot tub w/large game room. This house will comfortably sleep 16. Lower level has large family room , wood burning stove, dart board, pool table, stereo, 2 bedrms w/2 queen beds and other with twin bunk beds with TVs , bathrm, nookarea w/bar opening to a back yard with sitting area and fire pit. 1st level has open family room with gas stove with mantle, sectional sofa , flat screen TV, DVD player, stereo, dining area, complete kitchen , breakfast nook w/glass doors to deck for BBQs and relaxing in the 8 person Jacuzzi. Washer/dryer, linen closet w/a queen bed and a bathrm. 2nd level has 3 bedrms all with queen size bed w/doors to balcony, each w/their own TV and 1bathrm and 1 private master suite bathrm. 1 of the queen bedrm has a trundle that opens with 2 twin beds. Steps Away from Cranmore...: 5 minutes from village and outlets: 15 minutes from Attitash; 15 minutes from Storyland. Awesome location ! So much to do in North Conway! If you bring your own linens - 6 queens, 4 twins - don't forget your towels. We've been coming up to White Mountains since 1997. Our son was on the Cranmore snowboarding team. We love this area and the location of this house. This house is roomy, comfortable, neat and full of all the amenities you would need. It is located about 1 minute from Cranmore Mountain, 5 minutes from Conway Village and the Settler Green Outlets. Best location in the valley. Towels available to rent or bring your own. Renter must bring own towels for hot tub. Please bring your own spices. Folding table and chairs stored in lower level bedroom underneath beds. Cranmore Mountain Resort is less than one minute away. House provides pack n play, high chair. Bring your own bed linens and towels or you have the option to rent from linen service $80.00 which I will set up for you. Please bring your own paper goods - paper towels, dish detergent, trash bags, paper plates, plastic cups, toilet paper, etc. We provide (regular ceramic) dishes, glasses and coffee mugs and flatware (which have to be washed, dried and put away before check out). Please bring body soap and shampoo. NO RENTERS UNDER THE AGE OF 25. LOOKING TO RENT TO MATURE INDIVIDUALS THAT WILL RESPECT OUR HOME AND OUR NEIGHBORS. Overall, this is a good place if you have a sizeable group, and especially if you have a pet that needs to come along. Good locations to mountains and ample parking - this is a true ski and sleep home. There is, however, and 'interesting' smell in the home. At first, it seemed to be a simple older home smell, but some of the bedrooms it was much stronger...hard to describe it, but not pleasant. Also - don't expect luxury. There are lights hanging from the ceiling in the basement and the hot tub was not functional when we arrived. The owner was VERY FAST to send someone over to fix it and it did eventually work. They mentioned it was a new hot tub, but this may just be 'new' to them. It was a pleasure renting to this guest except for the dog urine left in my lower level rugs. That was the interesting odor that he speaks about. I could have charged him for the carpet cleaning fee but I didn’t because overall, he was a good renter and he was very nice. The hot tub is one year old and it has a brand new heater. One of the wires disconnected during his stay and it was fixed as soon as he informed me about it. Very comfortable. Big. Kids loved it. Good value for a larger group! Reasonably priced and a good value for what you get. Excellent central location nice trails to N Conway village. Walk, run, or bike. Everything in working order. Owner responsive to requests. No complaints. Perfect place to get your large group (and small dogs) up to the area so you can enjoy the beautiful outdoors. Saw 3 moose on our Moose Tour! Went floating the river on tubes, hiking the mountains on boots, and mudding the trails on atvs. Good time all around. Thank you very much. Hope to see you soon! Do not rent this place!! Renter beware!! If you're looking for a smelly, dingy and unmaintained house, this is the place for you. The house has a foul odor (either urine or dead animal smell) throughout, especially on the second floor. We actually found a dead squirrel in the laundry room next to the washing machine ?!?! The kitchen was disgusting. The stove was dripping with grease and we had to cook with dilapidated pots, pans and utensils (non-stick pan linings flaking off and mixing in with food?!?!). The basement game room is a run-down version of what it once was. Not only dirty and dingy, but destroyed dart board, no darts, broken foosball table, trashed bar and just an unenjoyable area. And the hot tub, while clean, was like sitting in a warm bath. We stayed for 3 nights and made the best of our stay. I communicated to Andrea (homeowner) on the evening of our departure. I tried to honestly communicate our unpleasant experience but she did not want to hear any of it. She argued that there was nothing that she could do because we hadn't communicated earlier (during the stay). I tried to explain that there was nothing her 'cleaning and maintenance' crew could have done to resolve our issues during our stay, the needs were just too significant (and we didn’t want to ruin the trip). I requested a refund for our stay. That was promptly declined by Andrea, but she did offer a token $500 refund for our displeasure in exchange for a positive HomeAway review. Thanks, but no thanks. If you are reading this, please understand that there are serious cleanliness and sanitary issues with this property. It does not match normal expectations for a rental property. I hope this gives you better insight into the real condition of this property. My family has rented many times in the past and this is our first negative review. This is what you call an extortion review. It is quite common and many property owners have to deal with these scams and dishonest renters. I had to open up a Case Complaint against this renter with Homeaway. The case has been ruled in my favor and the matter has been closed. I provided Homeaway with bills/statements from my cleaners and maintence crew; letters from cleaners; bills from carpet cleaning company; Brian's signed lease and his emails. Brian was looking for a full refund after he stayed at my house for 3 nights. Brian never contacted me during his stay to say that there was a problem with the house. Brian signed our lease which outlines what to do if there's a problem with the house. Brian must have signed the lease without reading it. Written in my lease is a sentence stating that if there is any issue with the house, the renter must contact the landlord immediately. Also, written is a paragraph stating that no refund will be given unless there is a valid reason which will be determined after maintenance crew, owner or cleaning crew inspects the house. Brian never contacted me during his stay. Prior to Brian's arrival, the house was cleaned top to bottom and the carpets were cleaned. On the kitchen table, was a note from the cleaners that if they have any issues, renter is to contact them and/or owner. Upon checkout, Brian sends an email to me stating that the house smelled. I immediately sent my maintenance crew and cleaning crew over to the house to see what he was talking about. Maintenance also inspected the house for dead animals - there aren't none - there weren't none. Brian send me a photo of a dead squirrel from outside. I cannot control what dies in the woods. Again, my cleaning and maintenance crew notified me and stated that the house does not smell and that they have no idea what Brian was talking about. The only true statement he is making is that the dart board is broken. For all I know - he broke it. It has been replaced. Any questions before renting? Contact me 6174552826. I will be happy to answer any questions or concerns. GREAT property! Can't wait to go back! This house is amazing! We were a party of 12 and there was room to spare! The property was well maintained and clean. The kids LOVED the Jacuzzi and pool table--kept them occupied for hours! The home is close to town--just a few minutes away. And we could literally walk to the mountain if we chose to do so. We had a question during our stay and the owner immediately got back to us. She was very responsive both before our stay and during our stay. I would highly recommend this home to friends and family. My whole family is looking forward to another visit. Great location in North Conway! Very close to downtown, Cathedral's ledge, and Diana's bath. The house easily accommodated our large family. Having a pool table was a nice feature to have during our down time. Ask about mid week specials. Located only ½ miles from North Conway Village and 400 yards to Cranmore Mountain Resort and Whitaker Woods. House is located next to a brook and abuts conservation land, great for cross country skiing and hiking trails. -10 minutes from Attitash, -15 minutes from Wild Cat and Black Mountain. Great location for all winter sports and activities. House is 2 miles from shopping outlets. Awesome summer sports activities including Story Land, canoeing, mountain climbing, swimming, biking, water slides, mini-golf or just relaxing. Conway Village offers a wide variety of delicious restaurants and night life. Landlord provides lease to Tenant. Please contact Landlord for all payment methods. Landlord accepts payments via Homeaway, Paypal, Square Register. FOR RENT BY OWNER $500.00 SECURITY DEPOSIT REQUIRED. $500.00 SECURITY DEPOSIT REQUIRED. NO RENTERS UNDER 25. LOOKING TO RENT TO MATURE INDIVIDUALS THAT WILL RESPECT OUR HOME AND OUR NEIGHBORS. PREFER PAYMENT BY CHECK OR MONEY ORDER. THANK YOU. THANK YOU. ASK ABOUT MID WEEK RATE SPECIAL!